Thank you to our contributors and readers! Thank you to our contributors and readers! We’ve enjoyed connecting with you during our five-year run (2012-2017). Our past posts will be available on this site for the foreseeable future. We plan to continue our hiatus indefinitely. Wishing you all the very best! Cheers! IMAGE: “Sunrise” by Georgia O’Keeffe (1916). Thanks to all of our followers, readers, and contributors for your ongoing interest in our site. We plan to extend our hiatus through autumn 2017. During the coming months, we hope you will visit some of our previous poetry & prose series (links below). IMAGE: “White Birch in Autumn” by Georgia O’Keeffe (1925). Happy summer! Revisit some of our poetry and prose series during our hiatus! We plan to take time over the summer for rest, reflection, and recharging. In the meantime, please revisit some of our poetry and prose series. Click one of the links below to reach all the selections in that series. Enjoy! June 24, 2017 — The fifth anniversary of the Silver Birch Press blog! We started the Silver Birch Press blog on June 24, 2012 — and today celebrate our fifth anniversary. Thank you to our community of contributors, readers, and nearly 10,000 followers for making the Silver Birch Press blog part of your daily routine. Cheers! For a trip down memory lane, below is a replay of our first post (June 24, 2012). To me, The Great Gatsby by F. Scott Fitzgerald is the quintessential summer book. It chronicles the hot months of 1922, when the Great War was over and the Great Depression was yet to come. The 1920s were a blissful time when possibilities seemed limitless — and everyone seemed to be having fun (despite, or perhaps because of, Prohibition). These were the years when the cocktail was borne (to make the booze go farther), when women bobbed their hair and danced with abandon. It was The Jazz Age, as Fitzgerald called it — a name that stuck. Every time I pick up The Great Gatsby — and I’ve read the book perhaps a dozen times — I am drawn in and enraptured by the book’s poetry and romance. To quote the song Kiplinger plays: In the morning, In the evening, ain’t we got fun. Yes, Gatsby is great fun — even with its sad ending. The story seems fresh and real, even though it took place 90 years ago. I believe, though, that required high school reading of Gatsby is ill advised. Teens are too young to appreciate the longing and loss portrayed in the book — which is much better read after you’ve suffered some major hard knocks out in the big, bad world. We all have a Gatsby in us — a hopeless romantic, an impossible dreamer who tries to hang onto the inner spark that makes life worth living. So pour yourself a lemonade (or something stronger), plop yourself in a lawn chaise, and dive into the greatest novel of all time. Happy Summer! On May 8, 2017, we hit one million views! We started the Silver Birch Press blog on June 24, 2012, and experimented for a few years while finding our niche. Today — May 8, 2017 — we hit one million views. Most of our growth has taken place in the past couple of years — since we initiated our Poetry & Prose Series, starting with our Self-Portrait Poetry Series in July 2014. Thank you to our community of contributors, readers, and nearly 10,000 followers for making the Silver Birch Press blog part of your daily routine. We are honored and grateful for your interest and participation in this labor of love. Poem by poem and story by story, we are making the world a better, more welcoming place. Cheers! Thank you to our followers, contributors, and readers! Counting down to one million views! Some time in May 2017, the Silver Birch Press blog will reach a significant milestone — one million total views! As of today — April 27, 2017 — we have hit 990,090 views! Thanks so much to our daily followers, readers, and all of our contributors for this amazing accomplishment! We started the blog on June 24, 2012 — and it’s been a great five-year ride! Our deepest thanks to all of our supporters! Onward! During 2016, the Silver Birch Press blog featured 11 poetry and prose series. Many thanks to all who participated. All told, our 2016 writing prompts generated 917 poems and stories — the vast majority written specifically for our series. Cheers! MY PRIZED POSSESSION Poetry & Prose Series (October 27 – November 24, 2016): 78 participants. Every once in a while, someone asks if we pay contributors — the person assumes we are making money from the ads that run under some posts. First off, wordpress.com runs these ads (and keeps all the revenue) to defray the cost of hosting free sites, such as ours. If a blogger wishes to remove the ads, it costs about $75 per year. To end this controversy, I have paid the fee — so, voila, the ads are gone (at least until next August). Second of all, we feel that we “pay” contributors by offering them the opportunity to promote their work — their websites, publications, and books — to our nearly 10,000 followers (and 800,000 site visits). Hope everyone enjoys our ad-free site! 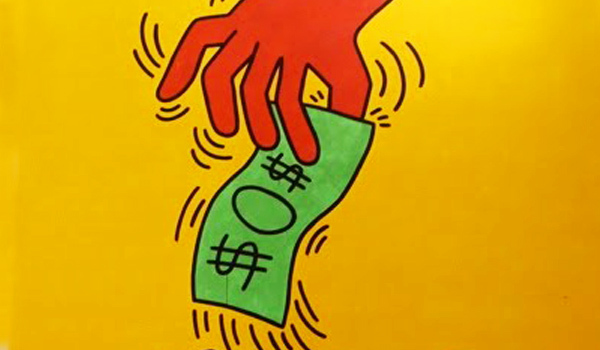 IMAGE: “Zero dollars” (detail) by Keith Haring. We just received a reminder from WordPress that today — June 24, 2016 — is our blog’s 4th anniversary! Thank you to all of our visitors over the past four years who, as of today, at 4:15 p.m. in Los Angeles, have visited a total of 742,016 times (yes, 3/4 of a million — each day, we are getting closer to the big number!). Thanks to the blog’s current 8,804 followers! Thank you to everyone who participates in our blog — as visitors, readers, writers, photographers, artists, commenters, and browsers! You have helped us build a thriving and vibrant community of readers and writers — from all corners of the world. During 2015, the Silver Birch Press blog featured 10 poetry and prose series. Many thanks to all who participated. All told, our 2015 writing prompts generated 965 poems and stories — the vast majority written specifically for our series. Amazing!